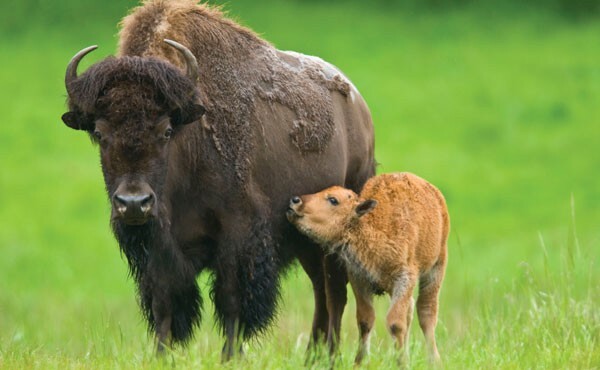 Close encounters with animals like caribou, bison and elk are just a drive away. This summer, Northwest Trek celebrates 40 years of wildlife fun in the Puget Sound. What started as a dream of two wildlife lovers, David T. “Doc” and Connie Hellyer, has become a beloved destination for animal lovers and adventure seekers alike. Drawing people from all over the globe, Northwest Trek strives to educate visitors about nature and its inhabitants. Conservation has been key in providing these ongoing opportunities by creating an environment where animals roam free, as if they were truly in the wild. Park visitors can board the tram and take a naturalist-narrated tour of the 735-acre wildlife park through the free-roaming area. Walking paths also offer an up-close look at the animals as they graze, nap and play. Activities such as Animal Trailside Encounters and interactive experiences in the Cheney Discovery Center can enhance every visit with hands-on learning. Those seeking more adventure can challenge their mental and physical stamina on a series of zip line and aerial obstacle courses. Visitors from age five to adult can choose courses from a few feet off the ground to an exhilarating eight stories soaring into the canopy. Overnight camping is offered throughout the summer months for those wishing to truly immerse themselves in the unique wilderness experience found at the park. To make the most of your visit, be sure to plan ahead since activities vary throughout the year and additional tickets may be required. Spend a day with the wildlife of Northwest Trek and find out what makes this destination a longtime Puget Sound favorite!